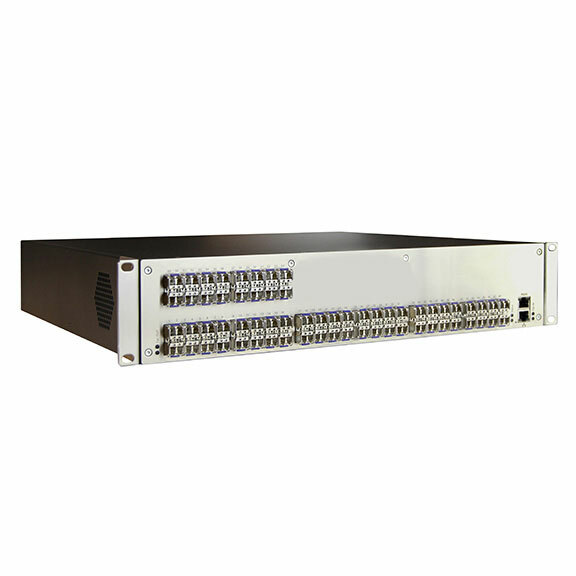 Enables matrix switching support for 64 DKM SM fiber endpoints. Supports central management of all attached endpoints, including firmware upgrading, user access control, configuration, etc. Other options available for applications that require Fiber matrices or higher port count. Supports central management of all attached endpoints, including firmware upgrading, user access control, configuration, etc. Instantaneous video switching. No delay or blanking. Full HD compatible. Boasts digital resolutions up to 4k60. Moves, adds, and changes are quick and easy. The DKM Matrix switch enables switching between computers and remote consoles. The DKM Compact switch is available in CATx and Fiber and in port sizes of 8, 16, 32, 48, 64 and 80. The DKM 64 and 80 port switches offer hybrid interfaces that support both CATx and Fiber. CATx endpoints can be extended up to 400 feet (122 m) and Fiber endpoints can be extended up to 6.2 miles (10 km). Each port on the DKM is agnostic and can support a transmitter or receiver. The DKM features instantaneous switching between sources using the same video resolution. Users can interact with this KVM switch via hotkeys, OSD, eternal Java Utility, or an API interface. The DKM can easily be cascaded to support future expansion in the event that every port is in use. The DKM solution features transmitter and receiver endpoint options that can support DisplayPort, DVI-D, DVI-I, HDMI, VGA, USB HID, USB 2.0, Analog Audio, Digital Audio, RS232, and RS422. Black Box can also help you support legacy interfaces such as Component, Composite, S-Video, RGB Video, even with PS/2 keyboards and mice. The DKM transmitters and receivers support CATx or Single-mode or Multi-mode Fiber which interfaces with the DKM FX KVM Switch. Question? Contact our FREE Tech Support. These DKM FX and DKM FXC components are part of a modular system and will need to be configured for your application. Please contact Black Box Tech Support Engineers for a FREE consultation. The Compact KVM Matrix Switch 64-Port FIBER w/Reduntant PWR-Supply comes with a standard 2 Year Double Diamond™ Warranty (Standard) already included.